It is KCWC and I am not participating. I am not at home and although it wouldn't be my first time to do the week of sewing while away, this time I am just not feeling up to it. Too much work, beautiful weather and 2 little boys are keeping me busy, even with my mom currently taking over most of the activities around the boys. So, I decided to cheat...a little. My brother got married 2 months ago. Since him and his wife have several nephews (all boys! ), we sort of tried to have them all dressed the same. The idea was: white shirt, grey trousers and the bow tie I was going to make for all of them. And I did, 6 bow ties for 6 boys ranging from 9 moths to 4 years old. 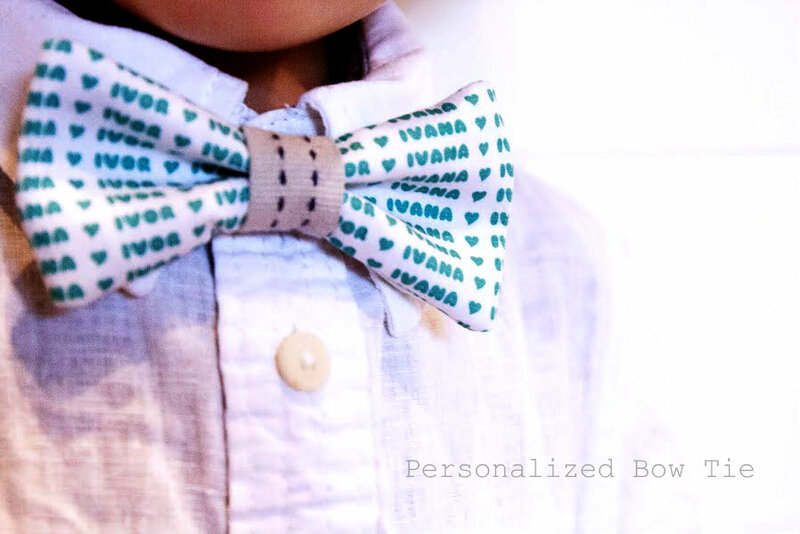 The print on the tie are the young couple's names with little hearts in between, using Sniglet font. I simply made a pattern for A4 paper and printed in out on a fabric printing sheet I had ordered from the US 2 years ago, but never got to use it. Fabric printing sheets work like paper, but when the fabric is taken of the paper backing it is quite thin, so I had to use some fabric backing to make the bows hold better. The rest is just sewing the bow as you normally would.